Stellar Planet: What is a planet anyway? What exactly are the wandering stars of ancient Greece that danced gloriously against the glistening canopy of stars that held constant in the more frequently cloudless skies of ancient Greece? This, however, is an incomplete definition and although correct (in terms of its implied context) it does not serve as a resolution to the task posed to the panel. Define “Planet”. 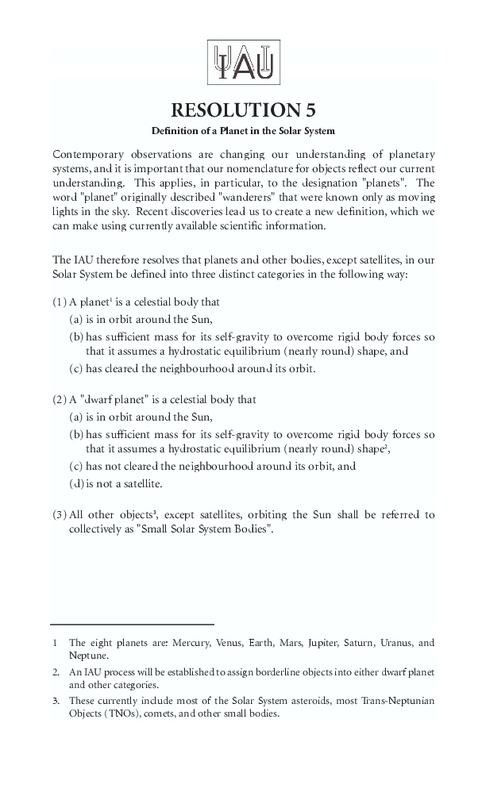 All of the definitions above can only be applied to our solar system; the word planet as defined by the IAU does not include any object that does not orbit the Sun. In an effort to be as precise as possible with regards to our own solar system they excluded all others, which back I 2006 still numbered in the hundreds. Perhaps to clear up this chagrin the above definition can be modified by just two words from “the sun” to “a star”. As we have already sorted out part a) above, let’s move onto part b). b) has sufficient mass for its self-gravity to overcome ridged body forces so that it assumes a hydrostatic equilibrium (nearly round) shape. 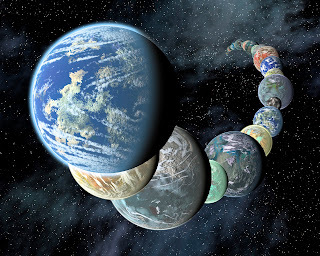 There have been suggestions in the past in which anything that is “round” or spherical in nature is called a planet; however, there are many problems with this. There are in fact a number of asteroids in orbit around the Sun between Mars and Jupiter that are spherical, but we would not consider being planets. Imagine if you hurled a perfectly spherical rock into space such that it then went into orbit around the sun, say between the Earth and Venus; would that then be considered a planet? No. The spherical nature of an object is, however, still an important concept to consider as it sets the lower mass limit for any object orbiting a star being called a planet at the limit of self-gravity forming its shape (or in other word that ability of the object to ‘pull itself together’). 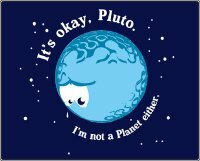 What this statement does not do is set an upper mass limit on planets, and where it is obvious in our solar system what that limit is, Jupiter, in other solar systems it becomes a larger issue (see what I did there). 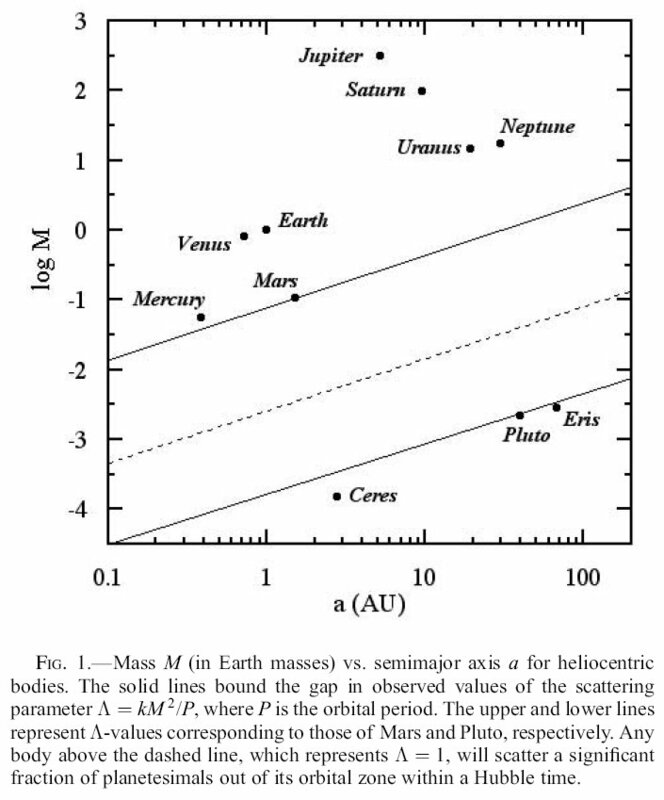 The ‘traditional’ upper mass limit on a planetary body is donated by that body’s ability to fuse deuterium at its core, which is around 13 times the mass of Jupiter. Above this other elements are fused up to the 60 Jupiter mass limit where lithium and hydrogen can be fused, then at 75 times Jupiter’s mass it is fusing hydrogen at its core and considered stellar. So with an array of very large exoplanets being discovered should the definition for a planet not also include an upper mass limit? Where M is the mass of the object and P is the orbital period around the star, which in a large part determined by its distance from the star known as the semi-major axis. 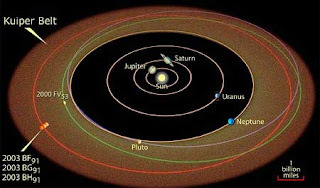 It is this property which sets asteroids, comets and Kuiper belt objects apart from the planets and from this follows the definitions for Dwarf Planets. b) has significant mass for its self-gravity to overcome rigid body forces so that it assumes a hydrostatic equilibrium (nearly round) shape. d) is not a satellite. So, why the fuss over Pluto? Since this decision it seems that a lot of people have grown very attached to the small icy world over 3 billion km away from home, becoming enraged that it has been demoted from the status of ‘Planet’ to that of a ‘Dwarf Planet’. 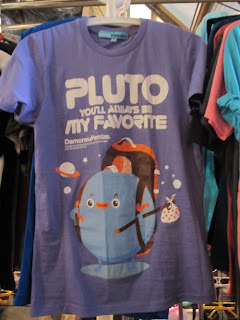 I, however, like to think of it not as a demotion but a promotion, from a small unimportant planet to the most significant Dwarf Planet and the leader of the Plutoids. 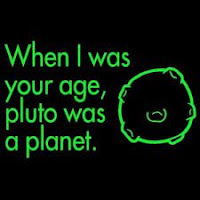 And remember science is not personal, Pluto was not just picked on because it was the runt of the litter; it wasn’t even part of the litter to begin with. I hope that this has cleared up the definition for planet for some of you and perhaps expanded on the definition supplied by the IAU in 2006 that if anything demonstrates clearly that when making decisions regarding the redefinition of word more time should be taking to make it an actual definition rather than a string of badly worded statements. And I shall leave you with these.